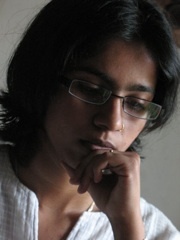 Praveena Shivram is a writer based in Chennai, India, and currently the Editor of Arts Illustrated, a pan-India arts and design based magazine. She has written for several national publications, including The Times of India, India Today, The Hindu Business Line, Culturama and Biblio: A Review of Books. Her fiction has appeared in the Open Road Review, Jaggery Lit, and Helter Skelter’s anthology of New Writing Volume 6. She is the recipient of the Prof. Barbra Naidu Personal Essay Prize (Open Category), 2017, and one of the winners of the DWL Short Story Prize (2017). She is a single mother of two children and an occasional powerlifter. She holds a Masters in Writing for Performance and Publication from the University of Leeds, UK, and a PG Diploma in Social Communications Media from Sophia Polytechnic, Mumbai.